My birthweek is over and a new year in my life has begun. It was beautiful, this past week of rest and no obligations. I had some very special moments. Setting up my back patio with my dad, shopping for new plants and pots with my mom. There was a good long snorkel with my cousin Joe along the reef where he and I spotted a massive lobster hiding under a coral head and two huge trumpet fish as well as the usual suspects. I got a kiss from a stingray at Stingray City and chocolate wine and beer schnaps from some of my dearest friends at the party my parents hosted. There was the hanging of my new hammock and the arrival of family members from overseas. There were dinners and lunches with friends – I am blessed with truly amazing ones – and a Happy Birthweek call every day for the whole week until the big day from my big brother mentor on the other side of the Caribbean. Monkey came back from Honduras to dance with my all night long to “I’ve had the time of my life” by the Black-Eyed Peas. (Two-year-old loves to dance!!) I had pig-ear salad for the first time after thinking of trying it for months. I planted out flowers and tomatoes with a friend of mine and we made my patio more of a jungle than it already was. There was grilled conch, conch soup, Cayman-style beef, carrot cake and chocolate layered cake, my mom’s macaroni-and-cheese (like NO other) and loads of lovely drinkies. I had an Eat. Pray. Love. moment with my jeans and a sunburn-turned-tan my girlfriends in London would pay good money for. It was drama-free time, restful, full of love and beauty and sleep. Just what I had hoped for. And then there was the ray. On our snorkel trip we made a stop at Coral Gardens, said by our boat captain to be 8-10 feet deep. We had figured out early on that 8-10 is his favourite range of numbers – he used it on all three stops. One was maybe 8-10, one was surely 6-8, and this one, Coral Gardens, was definitely closer to 12. As we swam silently over gorgeous coral heads of many colours just teeming with a rainbow of little fish my cousin Joe and I would take the occasional dive to the bottom, exhaling little bubbles to equalize and get up close to the waving purple and yellow sea-fans and yellow-striped Sargeant Majors. He and I drifted to the outer edges of the gardens, more experienced with fins and snorkels as we were the only islanders on the tour, and we got to know the lay of the ocean floor. Coming to the surface we’d make sharp spits out the spouts of our snorkels before continuing on. On one dive down, a good 8-10 (or 12) feet, I looked out of the gardens and into the open sea and caught a fright. Joe was just out of reach and I couldn’t grab him and show him. But hovering gently, just about a foot off the blue-tinted white-sand ocean floor was the most graceful ray I have ever seen. He was very black with pointy wings and a very long tail. Not your everyday stingray, this beauty. Oh no. 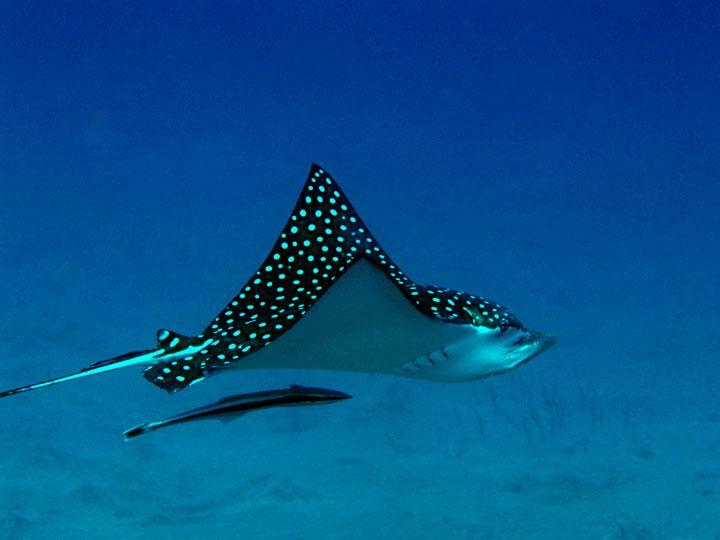 This was an Eagle Ray. He rose gracefully to the surface before my bulging, goggled eyes, flipped his tail and disappeared. I could feel pounding in my ears and I rose my head above the water spitting out the mouth piece and yelled EAGLE RAY! But he was gone. There were no less than 50 people in the garden that day and no one saw him but me. The closest shot I could find on the internet of the amazing view I had. This entry was posted in Island of the Stream, Journey of the Strands and tagged birthdays, blessing, Caribbean, diving, eagle ray, growth, sea, snorkeling by Nikki. Bookmark the permalink.